Hairstyles with fringe are taking the lead in defining new 2010 hairstyle trends. Straight fringe, side swept fringe, asymmetrical fringe, choppy fringe, pointy, angled fringe, wispy fringe or blended fringe are all terms you might encounter for describing this seasons hairstyles with fringe. It’s said that your hairstyle speaks volumes about you before you even utter a word . . . I believe it. So what do these hairstyles with fringe say? And, how would you describe the type of fringe that brings out your own personal flair? These hairstyles with fringe are some of the newest trends from top world renown hairdressers. Short hairstyles with fringe can be done on fine hair. Contrary to belief, those with fine hair can add more volume and shape to their hair by layering. This cut has crown layers, longer choppy wisps in the fringe and tapers at the neckline. The use of a gel or pomade on tips of hair after blow-drying will allow for the piecey look to this hairstyle. 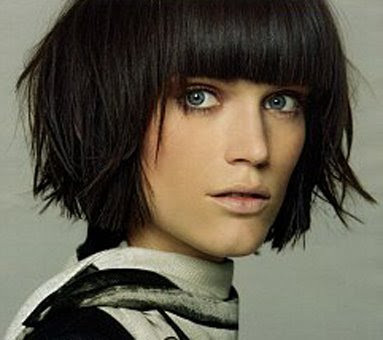 This slightly inverted bob with straight fringe reeks classy sophistication and style! The update on bob hairstyles with fringe this season is a more solid fringe just covering the brow. This hairstyle works best with straight hair by giving it great shape and movement. Shorter hair in the back pushes the longer lengths in front to a slight wedge effect. Make sure to pull out all your tricks for getting high shine with this hairstyle and your hair speaks class & style. Hairstyles with brow skimming fringe on short, medium and long hair are hot! Run a flat-iron through bang in small sections and slightly tip ends under to get the look. These styles can be worn by those of you with wavy hair too, as long as you will do the flat-iron work when styling. Use a thermal protecting spray and a shine serum for best results. Stay up with all the happenings in hair trends by following our Pinterest Hair Trends and Beautiful Bangs boards. March 25, 2014 By: Barb Quinn Hairstyle Blog Leave your comments (0), Your input matters.